View More In Honey Dippers - Page 4. Cooking has never been so easy and elegant! This oiled olive wood honey scoop is the perfect addition to any kitchen, and treated properly, will serve you for years to come. Measures 6-1/8-inches long. This scoop is made from oiled olive wood. Olive wood not only features a particularly attractive grain, it is also extremely hard due to its slow growth. The high oil content makes it water-repellent, non-slip and supple. Redecker olive wood products are exclusively oiled with no further treatment. For maintenance, rinse with water and blot with a towel to remove excess moisture and air dry completely at room temperature. Rub with regular olive or sunflower oil every now and then, and allow to dry. 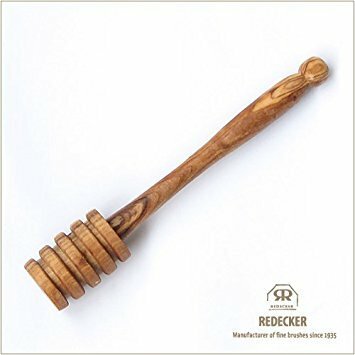 The first handcrafted Bürstenhaus Redecker brushes were produced in 1935. A lot has changed since then. Today, the name Bürstenhaus Redecker stands as it has for many years for an ideal combination of natural quality, function and design. It lives from the blend of inventiveness, sound craftsmanship and creativity. Bürstenhaus Redecker brushes are made of domestic woods, bristles, hair, and plant fibers, and have been for decades. Precedence is given to natural, sustainable raw materials. If you have any questions about this product by REDECKER, contact us by completing and submitting the form below. If you are looking for a specif part number, please include it with your message.